If we've helped in some way or you just feel generous, We would glady accept your kind donation. The price of our art and services are a constant strain to the up keep of our little business. So every little helps greatly! $10.00 - $20.00 per Sq.Ft, less or more dependent upon difficulty. An average mural costs around $1,750.00 at 10'x10' In certain cases you may benefit from a custom hand built canvas instead. 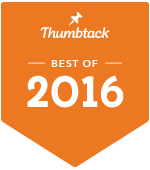 We cater to any and all artistic needs, our fine art solution is always the best option! Fort Worth Texax has the largest mural of Texas! 2660 Sq, Ft 133' x 20' That's a whole lot of TCU! Fort Worth largest mural. Biggest hand painted mural in the dfw Dallas area by far! This took 5-6 weeks to complete. Located at the Pop's Garage in Fort Worth Tx, only a few blocks from TCU itself. Check out this massive commercial mural. 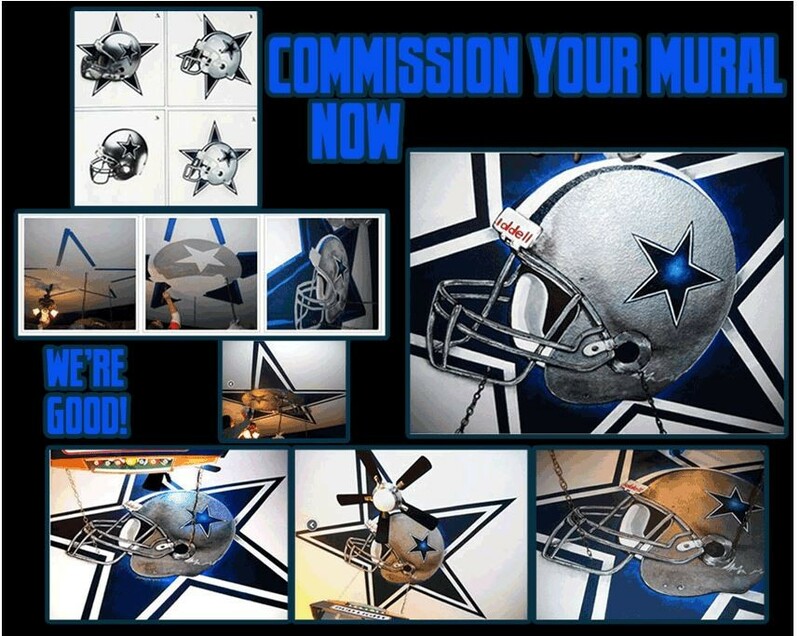 Best New Muralist Business To Hit Arlington, Fort Worth, Dallas & beyond! Murals are a way to show beautiful fine art in your home. You have a professional artist come and paint something completely unique to your needs or taste. Located in the Dallas, Fort Worth Texas area and serving Oklahoma, Austin, Houston, Galveston and beyond, we are available to drive to your place, be it residence or business. We paint and specialize in the huge commercial art murals that are perfect in large areas, just like a giant canvas.. Catering to signage, logos and bill board styled ads. Or maybe a painting that sums up your community. 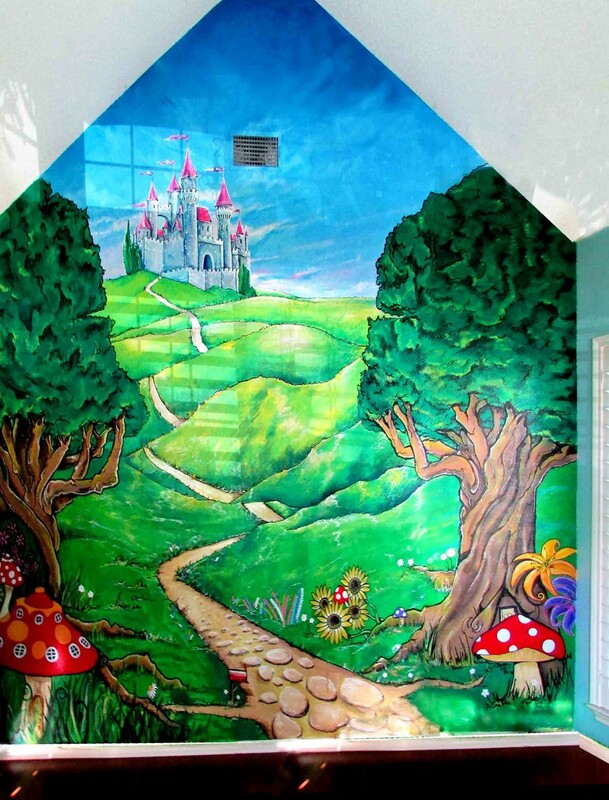 Kids bed brooms, nursery and man caves, dens and kitchen nooks murals are all a way to add something original and personal to you & your family. 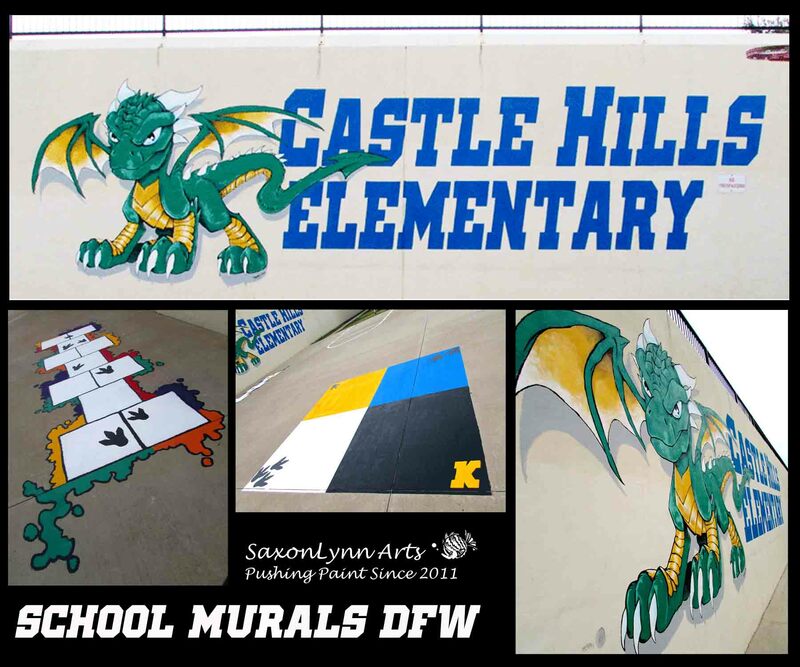 School mural commissions like elementary, day-care, middle school and high schools are a way to showcase your school's ability and class. Make that first impression really count. It doesn't have to be a school emblem, badge, mascot or school logos either, it can be a painted motto, a mantra or a phrase and slogan which your school lives by. can all do with a color coordinated hand painted mural that lasts for years. professional paints.If necessary we also use clear coats for protection against weather. Consider us for the very finest in mural painting. No lazy, blurred spray can graffiti. Instead you'll receive a brush painting with depth and contrast. Not to mention miles better than a decal or sticker. The only way to have a sign or logo painted is by hand to a professional standard that is crisp lined, sharp and beautiful. A fine art mural. Quality second to none. We were offered the commission of a life time! This is a mural project like no other. Here in Fort Worth Texas, this must be the biggest mural within a 100 mile radius or even throughout the state of Texas. Measuring at whopping 133x20' = 2660 sq. Ft.
We used 20 or so gallons of paint and created this mural over a 6-7 week period. The original design was agreed and then later adapted to encompass a tail gate trailer and advertising hording and Blimp. The mural was completed after a thorough power wash and prime using the highest grade exterior paints courtesy of Sherwin-Williams. Once primed we began the awkward task of tiling and projecting 20x20' portions of the main image. Once all lined up we were ready to take on the world's largest blank canvas! Although slow going for our pace, we finished ahead of schedule. We also completed the painting above standard requirements, as agreed by the contract. The client requested low/med detail in the square foot pricing, however we couldn't resist going the extra mile considering the opportunity to shine as artists. You don't paint murals this size very often so when you do, make it count. This is a 15' x 12' mural for a 3 year old named Elizabeth. What a lucky little girl she is! We created this mural from creating a design in photoshop utilizing varied aspects that make for a beautiful enchanted garden in a fairy tale setting, similar to Disney and all fantasy art you remember when you were a kid. There's everything you want and room for more. The wall is huge and the fine art involved is colorful and bold. You have to see this in person to appreciate the detail and composition. Two giant oak trees shade a nestled bunch inhabitants that reside on the outskirts of the Kingdom. Mushroom houses and giant sun flowers decorate the lower portion of the setting. All with tiny mail boxes off a pebbled pathway. All overlooked by a majestic grey and pink castle. This project, in the city of Fort Worth Tx took 5 days to complete. We project certain areas onto the wall before painting and then use our design or sketches as a guide as we hand paint the mural. We do not rely solely on a projector but in certain cases it is hugely beneficial for lettering or huge installations. We even left room for extra additions like a knight in shining armor or a unicorn, or even some birds & butterflies. This shows how we create the perfect design before painting. We always sketch and design via photoshop before we begin the painting. That way we email a finished proof for your consideration. The finished fine art mural will look nearly identical if not better. some artistic license is required to make a square fit into a round hole sometimes. The result is always the same; amazing! and so much better than anticipated. We often panic thinking that we have bitten more off than we can chew before a project, then completely surprise ourselves time again with what transpires. We stay modest and like a challenge and as such we stay on top of our game. Finally finished this massive canvas panel mural in Dallas Tx This painting was completed in one week. We aimed to give this fancy steakhouse restaurant a warm atmosphere. On display are traditional Brazilian "Gauchos" eating meat by an evening fire. The scene is capped off with cowboys herding cattle. Even the swallowtail birds are native to the Southern region of Brazil where these guys reside. This is a n indoor mural for the VB steak house. this is something very old and traditional in that instead of painting directly on a wall, we paint 4 canvas panels and hang like wall paper when completed. This is not something we are too familiar with. However we use a very powerful wallpaper glue and prime both sides of the canvas thoroughly. we hope when installed it will look amazing. the client can easily have the mural removed and re installed elsewhere. this mural measures 40' x 10' depicting a similar them to that of the outside mural. it shows a traditional Southern Brazilian scene of cowboys and western theme. cattle herding and "gauchos". the are preparing meats on fire hardened skewers in the exact same manner that they are prepared in the restaurant. We hope the huge mural gives a warm impression the the restaurant. It took a while. This massive 48' x24' logo and text hand painted mural now proudly advertises the Vila Brazil steak house in Fort Worth Tx. We used various equipment to complete this project; scaffolding as well as a scissor lift. We even used huge vinyl lettering. This job took nearly 2 weeks. Weather was a continual factor. we used the highest grade Sherwin Williams exterior paint. The orange was $65.00 per gallon alone. Our First Musical Instrument Mural For Our Local City of Mansfield Tx! Under The keys - Piano for Mansfield Texas Commerce Building. Which then spawned more fine art pieces on longboards and skateboards to a similar theme. All featuring an above, below the surface style. We had this piano in our home for a year and now it's finally completed and we think it looks outstanding! Sheri and I painted this piece together. This is the first of a series of 'above/below the water surface' paintings completed like this on skateboards too! Huge 12' x8' hand painted fine art mural right here in Fort Worth DFW Dallas area. From conception to finished mural we've got you covered. This was the second project commissioned for Pop's Garage in the DFW, Fort Worth Texas area, near TCU stadium and university. 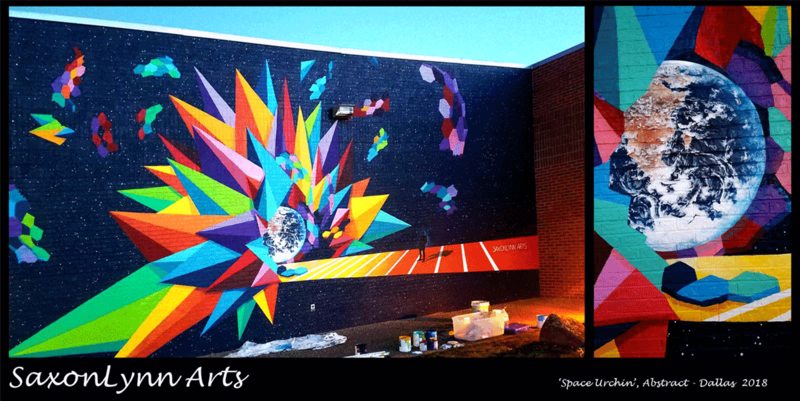 We projected the image of the logo re-designed ourselves and then began painting in the somewhat chilly early Nov air. You can see from the initial design the 2 signs are very similar. We always attempt to complete a project to the likeness of the design. Our hope is to convey an almost chrome like feel to the image. This mural took around 8 full days to complete. to use scaffolding Michael Angelo style.... We have very sore crooked necks, however the results were worth it! A very happy Cowboys fan too. Day1 Designs based on client's requests using mixture of sketches & illustration software. Day2 Second consultation, designs finalized. Day3 Begin prepping the area, painting. Day 6 Finish painting, tear down and tidy up, job done. Project was designed, agreed upon & completed within 2 weeks! Prices range in the Sq.Ft & level of detail. We use high quality paints, projection systems and sign & date all our work. We give free consultations & offer full mock up designs before we commence work. We accept 50% down payment on project with final payment upon completion. Guitars, Appliances, Cars & Vans, Indoor & Exterior! the canvas in the area of your choice. your home, office or out door establishment. from the 'Contact Page' for details. All artworks are the sole property of SaxonLynn Arts, No Copying, downloading to a PC or reproductions of any kind without expressed permission of Consent. All works under Copyright. Breaches are pursued to the fullest extent of the law.